What this dish lacks in aesthetics, it more than makes up for in flavour! 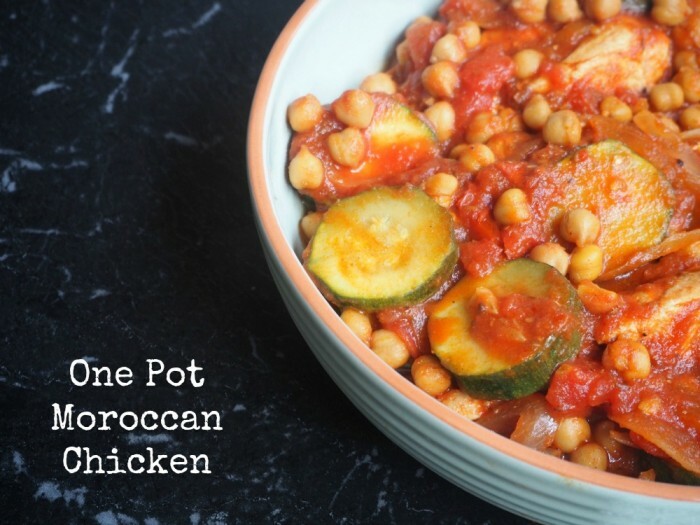 This North African casserole is low in fat, super healthy and freezer friendly! If it’s just us two, we often just halve the amount of chicken and use all the veggies, and, there you have it, an all in one winner dinner! If you are feeling super hungry or feeding four, serve with a side of cous cous. Season the chicken breasts with the cumin and lots of ground black pepper. Heat the oil in a large non-stick frying pan and cook the chicken with the onion for 4 minutes. Turn the chicken over and cook for another 3 minutes, stirring the onions until soft and golden. Tip the tomatoes into the pan. Swish the empty can with 250 ml (1 cup) water and add that to the pan too. Stir in the harissa, honey, zucchini and chickpeas. Bring to a gentle simmer and cook for about 15 minutes until the chicken is tender and the sauce has thickened.